When Srila Jiva Goswami was a little boy, he refused to play any game that had no relation to Kṛṣṇa, with other boys. He made images of Kṛṣṇa and Balaram and would worship Them with flowers and sandalwood paste and dress and decorate them. He would gaze upon them with unblinking eyes, sitting motionless on the floor like a golden doll. When he paid obeisance to the deities, his eyes filled with tears. He would offer their Lordships sweets and then take the prasad and distribute it to his friends. According to the Gaura-gaṇoddeśa-dīpikā (195), Śrīla Jiva Gosvāmī was previously Vilāsa Manjari in Vraja. In verse 203 of the same book, it is stated that he was the son of Vallabha and a scholar of exemplary character (suśīlaḥ paṇḍitaḥ śrīmān jīvaḥ śrī-vallabhātmajaḥ). According to the Gauḍīya Vaiṣṇava Abhidhāna, Jiva was present in this world from 1511 to 1596 (1433 to 1518 Śaka), but some other sources propose that Jiva lived from 1533 to 1618. It is not clear whether Jiva Gosvāmī ever met Mahāprabhu directly. However, there is a hint in the Bhakti-ratnākara that Jiva Gosvāmī was a baby when the Lord came to Ramakeli. Jiva Gosvāmī demonstrated an interest in devotion to the Supreme Lord from his early childhood. Even when playing with his friends, he was only interested in games that were connected to the worship of Kṛṣṇa. 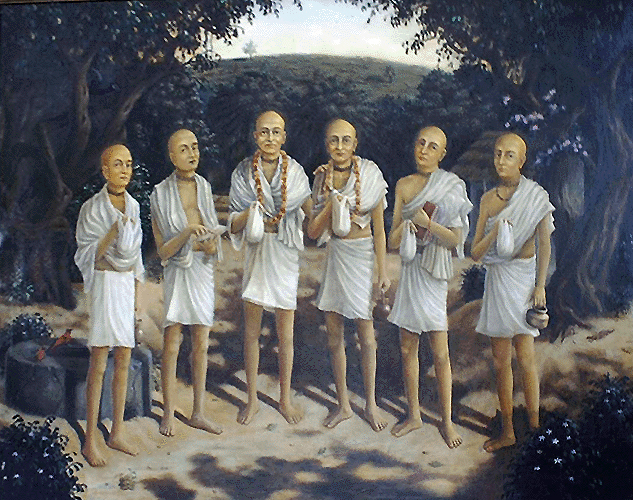 By Nityananda Prabhu’s grace, Jiva Gosvāmī was able to visit all the sacred sites in Nabadvīpa Dham. After completing his tour of the dham, he travelled to Benares where he studied all the scriptures with Madhusudan Vachaspati. Then he went on to Vrindavan where he remained under the tutelage of Rupa and Sanatan Goswamis. Śrīla Bhakti Siddhānta Sarasvatī Gosvāmī Ṭhākura Prabhupad has given the following summary of Jiva Gosvāmī’s life in his Anubhāṣya to the Chaitanya Charitamrita: “After the disappearance of Rupa Gosvāmī and Sanatan Gosvāmī, Jiva Gosvāmī was established as the topmost teacher of the Gaudiya Vaiṣṇavas of Orissa, Bengal and Mathura provinces. He engaged everyone in the worship of Kṛṣṇa through teaching the truths given by Mahāprabhu Himself. He would occasionally perform Vraja Dham parikrama with the other devotees and sometimes would go to visit Vitthalnath in Mathura. The loss of the scriptures refered to in the above paragraph took place when agents of the king Bir Hambir of Vana Viṣṇupur stole them. Later, when the king heard Srinivas Acharya speak on Śrīmad-Bhāgavatam, he was converted to Vaiṣṇavism and took initiation from him. Srinivas Acharya thus recovered the books. All this is described in full in this volume in the chapter of Srinivas Acharya. Śrīla Bhakti Siddhānta Sarasvatī Gosvāmī Ṭhākura Prabhupad has given the following warning in his Anubhāṣya to those inexperienced persons who might be deprived of Kṛṣṇa-prema through the influence of ignorant and offensive Sahajiya teachings: “Three slanderous ideas about Jiva Gosvāmī are current amongst the ignorant Prakrita Sahajiyas. Anyone influenced by these calumnies, which are fundamentally inimical to Kṛṣṇa, the guru and the Vaiṣṇavas, will become increasingly offensive and end up losing his taste for service to the Supreme Lord. “(1) It is said that a certain dig-vijayi scholar, eager to amass mundane prestige, came to Rupa Gosvāmī and Sanatan Gosvāmī to get their signature as an admission of defeat in debate. Jiva Gosvāmī’s gurus conceded defeat without any argument and the arrogant scholar proclaimed them to be nothing more than ignorant fools. He then asked Jiva Gosvāmī also to sign such an admission of defeat. Jiva Gosvāmī, however, decided to take on the puffed-up Brahmin in debate in order to silence his scurrilous tongue. In this way, he preserved the integrity of his spiritual master’s reputation and demonstrated the ideal behavior of one who is guru-devatātmā, (one who recognizes his spiritual master to be his worshipable deity and source of life). Some ignorant Sahajiyas, however, say that Śrī Jiva’s behavior went contrary to Mahāprabhu’s teaching of being humbler than a blade of grass and of giving respect to others. Indeed, they say that Rupa Gosvāmī chastised Jiva Gosvāmī for this very reason and ostracized him for some time, and only when Sanatan Gosvāmī interceded on Jiva Gosvāmī’s behalf did he accept him again into his association. “Only when these enemies of the spiritual master and the Vaiṣṇavas receive Kṛṣṇa’s mercy and begin to see themselves as their eternal servant, will they also receive Śrī Jiva Prabhu’s blessings and be able to understand what it really means to be ‘humbler than a blade of grass’ and ‘a giver of respect to all’. Only then will they be eligible to chant the Holy Names in the proper way. “(2) Some other foolish Sahajiyas say that when Jiva Gosvāmī first read the Chaitanya Charitamrita with its clear and brilliant explanation of the divine devotional sentiments of Vraja, he was afraid that it would hamper his own scholarly reputation. He therefore threw the manuscript down a well in a spirit of mean-mindedness. Upon hearing of this, Kṛṣṇa Das Kaviraj Gosvāmī was greatly shocked and immediately gave up his body. Fortunately, Kaviraj Gosvāmī’s disciple Mukunda had made a copy of the original manuscript and thus it was preserved and later published far and wide. Had Mukunda not done so, the Chaitanya Charitamrita would have been lost forever. This is another contemptible bit of invention based on an inimical attitude to the guru and Vaiṣṇava. It has no basis in reality and there is no possibility of its being true. “(3) According to other sense-obsessed fornicators, Śrīla Jiva Gosvāmī should not be accepted as an authority because, in his treatises, he did not accept Rupa Gosvāmī’s pārakīyā-vāda idea, but rather supported the svakīya-vāda. They say that he cannot be accepted as a rasika-bhakta, or a devotee who is knowledgeable in the divine sentiments. One hot summer’s day, while Rupa Gosvāmī was writing Bhakti-rasāmṛta-sindhu in seculsion and Jiva Gosvāmī was fanning his perspiring body, Vallabha Bhatta came by to see Rupa Gosvāmī. After reading some of Rupa Gosvāmī’s introductory verses, he offered to make a few corrections. When Vallabha Bhatta went to the Yamuna to take a bath, Jiva Gosvāmī followed him on the pretext of going to fetch water. In fact, he was angry because he considered Vallabha Bhatta’s proposal to be arrogant. He asked him what fault he had found in Rupa Gosvāmī’s verse. Vallabha Bhatta told him and Jiva Gosvāmī immediately showed him the flaws in his argument. 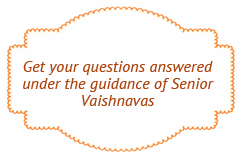 A debate ensued in which Jiva Gosvāmī countered every one of Vallabha Bhatta’s objections. When he came back to Rupa Gosvāmī’s hut, Vallabha Bhatta told him how impressed he was with Jiva Gosvāmī’s scholarship, recounting the entire episode. Rupa Gosvāmī gently rebuked Jiva Gosvāmī, telling him to return to Bengal and to come back to Vrindavan only when he had calmed down. Thus banished from his presence, Jiva Gosvāmī left Rupa Gosvāmī’s dwelling, and went to Nanda Ghat, a nearby village. Hoping to regain his guru’s favor, he began to practice rigorous austerities, worshiping Kṛṣṇa intensely while fasting or eating only a bare minimum. As a result of such severe practices, his body became weak and sickly. One day, Sanatan Gosvāmī happened to come to Nanda Ghat and discovered him in this condition. He was moved and took Jiva Gosvāmī back with him to Rupa Gosvāmī and appealed to his brother to forgive him. Rupa Gosvāmī and Jiva Gosvāmī were thus reconciled and Jiva Gosvāmī once again began to receive Rupa Gosvāmī’s affectionate blessings. Jiva Gosvāmī’s appearance day is on Bhadra Śuklā Dvādaśī, his disappearance day is Paush Śuklā Tṛtīyā. 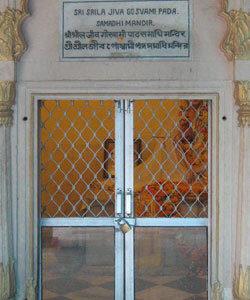 His deity, Radha-Damodar, is still being worshiped in the Radha-Damodar temple in Vrindavan. His samadhi tomb is on the grounds of the Radha-Damodar temple and his bhajan-kutir is preserved in Radha Kund, near Lalita Kund.